Do Relaxers Damage Your Hair? You may remember this client that I had a while ago from being featured in the "How To Grow Your Edges Back" post. When I took this picture it was her first time coming to see me. 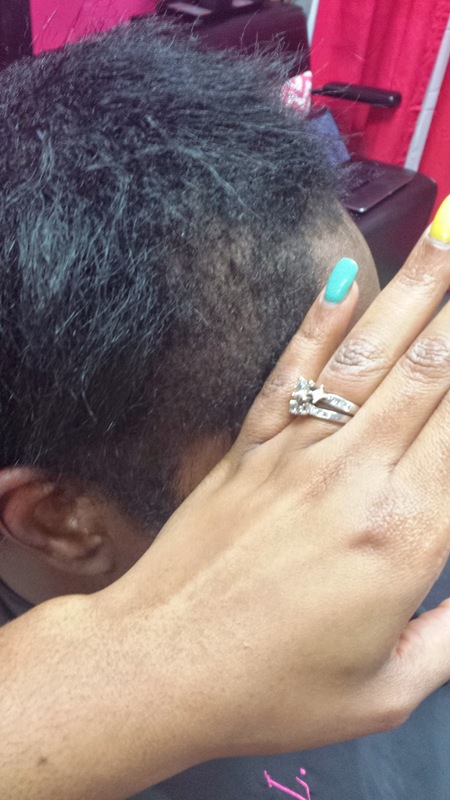 She was getting relaxers every four weeks and at one point she thinks that her previous hairstylist gave her a permanent hair color as well, even though she told her that it was a rinse. As a result, her hair came out drastically which resulted in the pictures seen below. We put her on a routine of coming weekly in which she received a combination of protein and moisturizing treatments to get her hair back healthy. I am happy to say that her hair did begin to grow back and become healthy again. However, like a few other clients that I have had in the past, once I get there hair back healthy the visits decrease and sometimes the client starts back doing things that got there hair damaged in the first place. 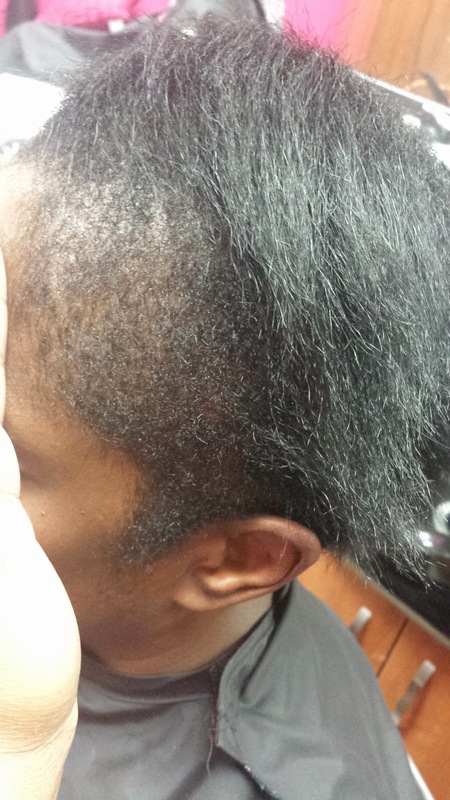 This client began going back to the same stylist and receiving relaxers again. As a result, her hair began to come out again! Are relaxers damaging your hair? Now we are basically back to square one and she is now going to be coming back to me on a regular basis again until her hair gets back healthy. So, to everyone who wonders do relaxers damage your hair, the answer is that it is definitely possible. If used correctly, you can still have healthy hair. I always tell my clients that I am a hairstylist who specializes in healthy hair. Therefore, it is highly unlikely that I will give someone a relaxer without them having enough new growth to relax without it overlapping. Some clients who are dedicated to having healthy hair will take my advice and do everything that I suggest to them. Others say they want healthy hair but do not want to do what it takes to get it. This client did everything I suggested to her but once her hair got back healthy she slipped back into doing unhealthy things to it with a stylist who does not treat hair the way that I do. As a lesson to all of you ladies reading this post, you can definitely have healthy relaxed hair. To do that, you MUST treat your hair right and practice healthy hair habits in order to avoid damage.